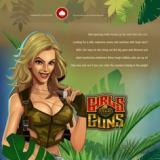 Leo Vegas is a casino that has strived to be the best ever since its launch. This means plenty of games (from no less than four suppliers), a top notch mobile offering and plenty of offers. LeoVegas based in Malta, was formed in late 2012 and have stormed the Mobile Casino market with a Bang! 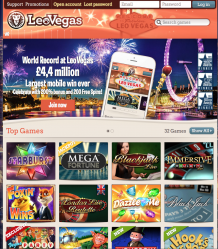 As the leading mobile casino, Leo Vegas are up to date with all of the latest Mobile games, their site is fun and very easy to navigate and available on mobile, desktop and tablet. Joining this casino couldn’t be easier with just 2 stages and away you go! Once you have joined Leo Vegas you are immediately able to play with their generous offer of 20 free spins on Starburst, followed by another 180 once you have made your 1st deposit. It doesn’t stop there as your 1st four deposits are offered a deposit bonus as well! What offers do you extend to new players? What about existing members, do they have any ongoing perks? For our valued existing members they will be sent free spins now and then to play our games and there are always on site promotions and prizes to be won. Not to mention the number of large jackpots that are available at LeoVegas and a bonus on the first 4 deposits! How can players deposit at Leovegas? 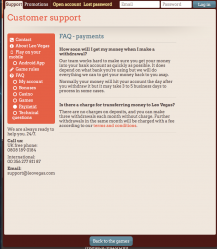 What features does LeoVegas have that makes it different from other sites? Leovegas’ simple and easy to use design, along with an incredible range of over 350+ games plus a generous welcome offer makes it the King of mobile casino. We also have an exclusive NETENT game ‘Vegas Party’ that’s become very popular and you can’t play anywhere else!